Breathe like a jellyfish — and use your entire diaphragm. Have stamina like a shark — when you breathe completely you will become less fatigued and have the energy to go and go and go. 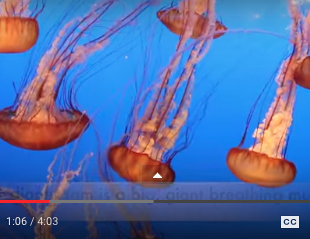 You’ve watched jellyfish swimming in those awesome tanks at the aquarium. It’s mesmerizing. Here they are again for your viewing pleasure but also to make a point. Jellyfish are shaped just like our diaphragm–our biggest breathing muscle. When a jelly swims it uses it’s entire jelly body. You should do the same when you breathe — use your entire jelly body (or diaphragm). The illustration is in this video. When you are ready to move on with more videos, just click on the Scolio-Pilates tag just below the video. You will immediately be shown a full listing of our Scolio-Pilates video collection. There are loads of free videos here to help you and there are always more on the way. Let me know if you have any questions about this one, Breathe like a Jellyfish… Stamina like a shark! And I’ll see you on the beach next time! Breathe like a jellyfish… Stamina like a shark!